On several occasions, I’ve been poised to join the crowd of liberal commentators ritually denouncing Harry Reid for passing on his anonymously sourced claim that Mitt Romney may have paid on the order of no taxes for ten years. What always held me back was a slight nagging concern: What if Reid is right? At this moment I’m glad I hesitated, because I now suspect Reid is right. Oh, I’m not sure that the underlying claim about Romney’s tax payments is right. I suspect it’s a kind of colloquialism — “no taxes” is rich-guy talk for, say, a single-digit tax rate. But I do think Reid has a real source here. 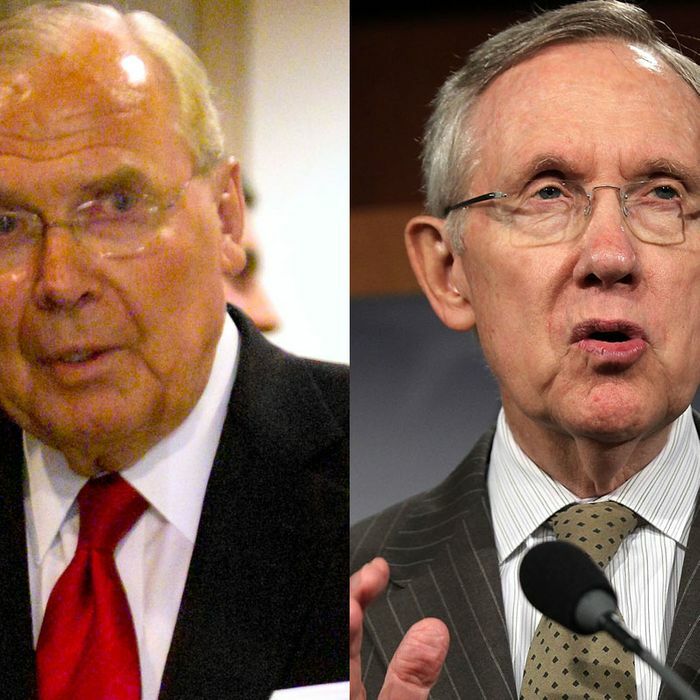 Markos Moulitsas and a host of other online sleuths have compiled a pretty persuasive case that Reid’s source is Jon Huntsman Sr. Reid has described his source as a major Bain investor and a Republican. Huntsman (the father of the former candidate who’s now backing slowly out of the GOP) is a major Bain investor and a business partner with its managing director, as well as a Reid donor. Abby Huntsman curiously co-bylined a Huffington Post story claiming inside information about Romney’s returns. So, assuming his source is Huntsman or some other legitimate figure, does Reid have a right to repeat what he heard? The answer becomes more clear if you consider it from Reid’s perspective. You’re Harry Reid, and a Republican you know with strong Bain connections passes on that the tax returns Romney refuses to release reveal that he is paying “no” taxes. Must you refrain from declaring this to the world? Given that Romney’s tax returns are something most people believe he is ethically obligated to release anyway, I’d say no. Again, we ought not take Reid’s source’s word for it, which I think is exaggerated. But, unless Reid is just making this up and the Huntsman circumstances are a coincidence, in which case he’s a contemptible liar, I think Reid has a right to pass on a reasonably well-sourced rumor and throw the ball into Romney’s court.